Missoula's Smokejumper Visitor Center helps you visualize this physically and mentally demanding job by showcasing its colorful history through displays, videos, and tours of the smokejumper training and preparation rooms. A tour of the Missoula's Smokejumper Visitor Center is FREE! Located 4 miles from downtown Missoula, Montana. During the summer, tours are available at 10am, 11am, 2pm, 3pm, and 4pm. Call at least two days ahead for an appointment in the winter. Come and learn about the unique and challenging job of a smokejumper. Missoula, MT has been at the heart of smokejumper training and education since the first fire jump in 1940. Smokejumpers are charged with the job of suppressing wildfires in remote and roadless mountainous terrain. To save energy, they parachute into fires instead of wasting energy hiking in with very heavy packs. Simply put, they are firefighters. Missoula's fleet of smokejumpers boasts men and women ranging in age from their 20's to their 50's. The mental and physical requirements for the job are unlike any other. 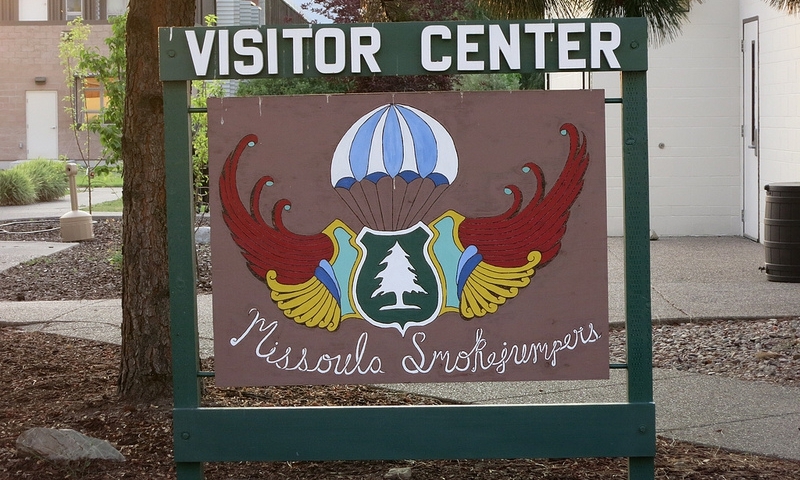 Today, Missoula is home to the nation's largest smokejumper training base in the country. The Smokejumper Visitor Center is fascinating. Displays offer dioramas and videos that detail different aspect of fire suppression. Inside you can explore the 1930's replica of a lookout tower, tour the smokejumper's loft, and view the training facilities. A tour of the ready room and the load masters room will let you see what the jumpers do when a call comes in and where and how they prepare for the fires. The unique job of smokejumpers paired with a well laid out visitor's center will leave you talking about your visit to the Smokejumper Visitor Center for days. The Smokejumper Visitor Center is just a couple of miles from the heart of downtown Missoula, MT. You will find the center at the Aerial Fire Depot, a ¼ mile west of the airport. From downtown Missoula, take West Broadway north and take a left as if you were turning into the airport. Take a left on Aviation Way and follow the signs to the Smokejumper Visitor Center. You can also take I-90 west, exit at Airway Blvd, take a left at the end of the exit ramp and a right onto West Broadway. From there, follow the directions listed above. Call two days ahead for appointment and reservation.